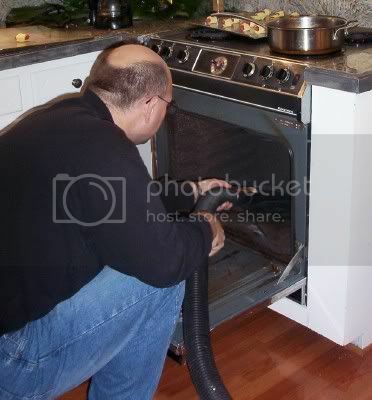 Like Merchant Ships: Clean Your Oven...The Manly Way! Clean Your Oven...The Manly Way! We had a kitchen disaster this morning. My husband started assembling the traditional pigs-in-a-blanket to eat during the Army-Navy football game. He was just about to pop the first tray in the oven when he smelled smoke. Uh oh! The house rule is always, always check the oven before you preheat--sometimes I have a big tray or pan stored inside. He rushed to pull the contents out of the oven...but instead of pots and pans, the oven held two smoking plastic bags of birdseed. They burst, their contents cascading all over the oven and floor. I had stashed them in the oven during yesterday's party. My husband used the Shop Vac to remove every last seed from the oven and the floor. Surprisingly, the Shop Vac did an excellent job cleaning the char and crumbs, too. When he saw the camera flash, my husband groaned. "You know I have to put this on my blog, right?" "Right. Just make sure you add GO ARMY! while you're on there." It's a small price to pay for a sparkling clean oven, don't you think? How funny! I'm glad the bags just smoked instead of melted. What a mess that would have been! Oh my! Thank you for a good laugh. I never in a million years would have guessed bird seed in the oven. LOL!! !